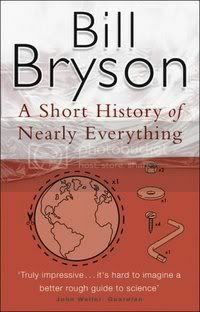 I am trying to imagine what this book would have been like if Bryson had decided to write not a short history, but just a history or even an extended history. Knowing Bryson as a travel author, I had not been really prepared for Made in America, where culture and language took centre stage. Now I knew in advance that this was going to be a tough read. I was right. It has taken me nearly the same time it takes a baby to advance from egg to a self breathing creature. Though I had to read some other books in between as well obviously. The book is fascinating, but one can only manage so many new facts at the time. Especially the chapters on atoms and quarks were quite difficult with only 2 years of science under my belt. Good thing about the book is that Bryson manages to explain everything (hence the title?) so clearly that even rocket science seems like doing a four piece jigsaw puzzle. I have really enjoyed reading the whole book, though I have to admit to skipping the notes after the last chapter. I wish I had made notes while reading it, there are so many inexplicable things that Bryson explains through one easy comparison, but I have forgotten most of them again. Perhaps read the book once every second year?